Puente de Villarente to Leon 12 km. 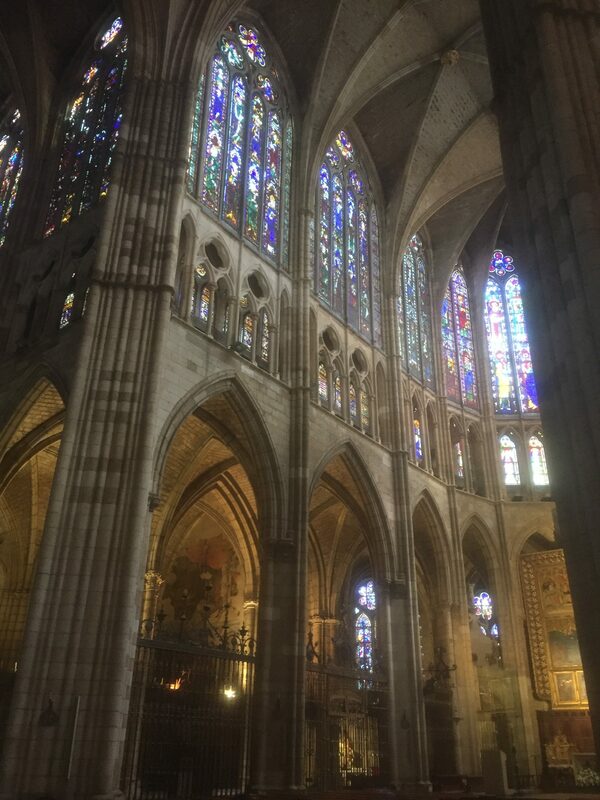 A short morning stroll through the suburbs with good company brought me to Leon, home of an impressive Romanesque church and a gothic cathedral with some of the finest stained glass in all of Europe. After many nights of Albergue snoring and uneven sleep, I opted to spend a little extra money for a single room in a hostel– my own bed with sheets, a shower, and even a television (and no evening Albergue curfew). Saw many pilgrim friends–the three North Carolina hikers, Gloria, Sophia, Michelle, Elena, Rudy, Jens, but I missed saying goodbye to Noeleen who is abandoning because of nagging injuries. Replaced my shoes with some new Salomons, not sure they are the right ones, but at least they fit. Leon is an interesting town with a brew pub–first IPA in months–and lots of free tapas.